This three-part blog series explores the advantages of a modern ERP solution for apparel companies. Part 1 examined industry trends. In Part 2, we describe the features of SAP S/4HANA® Fashion. A version of the series originally appeared in Apparel Magazine. 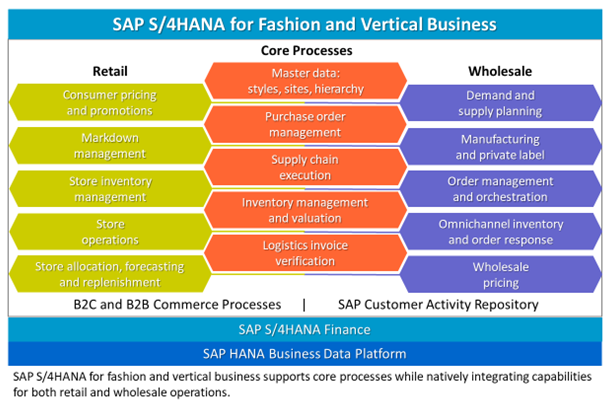 SAP has introduced an industry-specific variant of its SAP S/4HANA next-generation ERP software: SAP S/4HANA for fashion and vertical business and SAP S/4HANA Retail for merchandise management – or, as we refer to them collectively, SAP S/4HANA Fashion. This new ERP platform can propel fashion brands into the digital future. Data analytics – Because it’s built on an in-memory platform, the solution lets you capture, manage, and analyze data at unprecedented speeds. Near-real-time analytics enable you to understand buying trends and shifts in customer behaviors and preferences as they are happening. That can allow the business to rapidly respond to changing demands and deliver personalized offers in the right channel at the right time. Ease of use – With the SAP® Fiori user experience, employees no longer need to struggle with complex software screens or manually enter transaction codes. Instead, they get an interface built around a familiar “tile” structure, and they get the same experience across desktops, laptops, and mobile devices. Those capabilities drive employee satisfaction, adoption, and productivity. IT simplification – With retail, wholesale, and manufacturing processes all in one solution, you benefit from a simpler application landscape and simplified business processes. You can manage pricing, promotions, assortments, planning, warehousing, transportation – all your core processes – in a common IT footprint. Operations are better integrated, and performance is faster – crucial to businesses that manage a large number of stores, SKUs, and transactions. Merchandising – SAP S/4HANA for fashion and vertical business supports key processes around merchandising, including assortment planning, pricing and promotion management, and merchandising analytics. Importantly, these can now be managed together with wholesale and manufacturing processes. You get an end-to-end view of all your products, all your labels, all your inventory and all your stores. You can enhance these capabilities with SAP S/4HANA Retail for merchandise management. This solution lets you manage seasonal processes, distribution curves, value-added services, transportation chains, characteristic value conversions, and more. With SAP Fiori In-Store Merchandising apps, store managers can perform store walkthroughs and order products, print labels, transfer stock and more, right from their mobile device. And with SAP Hybris Merchandising, you can leverage real-time metrics to understand which products are selling and which fashions your customers want. That enables you to adapt your merchandising mix to current conditions and present customers with the right products and offers at the right time. Procurement – For procurement, SAP S/4HANA Fashion supports merchandise buying, invoice management, and private-label manufacturing. You benefit from one set of master data, with transparency across processes. In addition, a stock/requirements list gives you an always-current view of stock and requirements. And a purchase-order workbench feature lets you quickly adapt purchasing documents to changing circumstances. Supply chain management – You can optimize all your supply chain processes, from forecasting and allocation to warehouse management and transportation management. Two building blocks are especially helpful to fashion brands. First, SAP Customer Activity Repository (CAR) allows you collect, cleanse, and centralize multichannel customer and point-of-sale (POS) data in real time. CAR prepares that data for forecasting and makes it ready for consumption by other applications. Second, SAP Extended Warehouse Management provides sophisticated warehouse processes integrated with supply chain logistics. You gain visibility and control to optimize inventory tracking, cross-docking, and multichannel fulfillment – all in real time. Omnichannel commerce – Let’s face it: If you’re not working toward omnichannel visibility and customer experiences, you might as well close your doors now. But every apparel company knows that true omnichannel commerce is hard to achieve. SAP S/4HANA Fashion can help. It offers functionality that supports in-store, online, and mobile commerce; omnichannel customer order management; omnichannel customer service; and omnichannel customer insights and personalization. That’s all supported by the real-time data analytics of the SAP HANA® in-memory platform. SAP S/4HANA Fashion provides a solid foundation not only for existing processes but also for future innovation. AI and ML can optimize manufacturing processes, improve customer interactions and automate routine tasks. As just one example, ML can train the system to match incoming payments against existing invoices, fully automating the processes. It’s capabilities like these that make SAP S/4HANA Fashion so compelling – and worth the investment today. In Part 3, we’ll offer guidance on ERP implementation.